The Religion of Murder and Mayhem strikes again, proving once again that Islam is incompatible with Western civilization. The offices of Charlie Hebdo, a satirical weekly French magazine, have been burnt down in a firebomb attack on the same day that it published a special edition entitled “Charia [Sharia] Hebdo” with the Prophet Muhammad depicted as editor-in-chief. The paper’s website was also brought down by hackers in what staff believe was retaliation for the publication, which “celebrated” the victory of an Islamist political party in the recent Tunisian elections and the promise from Libya’s interim leader that Sharia law would be the principal source of legislation in the country. 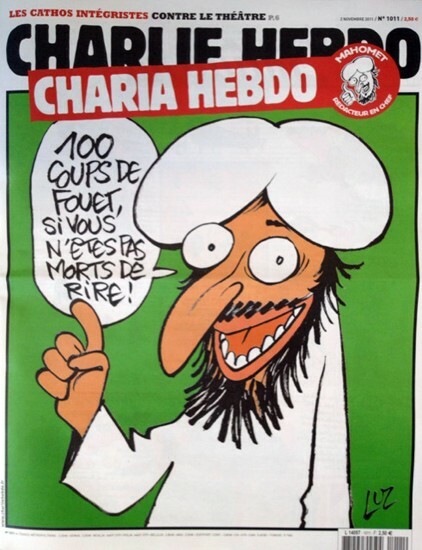 The magazine’s front page carried a large picture of the prophet, which is forbidden in Islam, with the caption: “100 lashes if you are not dying of laughter”. Free speech is a basic tenet of a free society and satire is a subset of free speech, including the right to satirize religion. Of course, there is no freedom of speech in Islam, under Sharia law, which would be fine if they kept to themselves and Muslims, driven by the basic mandates of their religion, weren’t continuously attempting to conquer and impose their beliefs and values on, often by violent means, the infidels of Western civilization.